Carving a niche for the organization, we are engaged in bringing forth the clients an excellent assortment of germ separation system. Our entire products are manufactured in strict compliance to the international quality standards using premium quality raw materials and advanced tools and sophisticated technology. 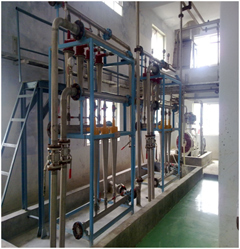 Germ separation system is designed scientifically and has proven performance. Each Germ Separation System is constructed of stainless steel with modular components, and requires minimum amount of floor space. If floor space is limited, or the area is irregular, we can custom design the system to fit into the space available. In germ separation system, the first stage makes a selective separation for optimum purity and the second stage increases germ recovery by capturing any germ that might have bypassed in the first stage. Its distinct benefits are good abrasion resistance, cleanliness and quick individual replacement due to quick penning couplings. The germ separation system has become the standard offering for larger plants, offering operations with proven efficiency. We also offer customization of the range as per the requirements of the customers. Germ separate system is known for their attributes such as low maintenance, durability, excellent performance and perfect finish.